Following last week’s win over Lurgan Celtic, Institute had high hopes of making it two wins in a row, but they were left frustrated as they drew 1-1 with Ballyclare Comrades. It was a game that Kevin Deery’s team should have won, as they dominated for long periods, and created the best of the goal-scoring opportunities. However their inability to get the crucial second goal, thanks in main to the performance of goalkeeper Gregg Shannon, cost them dearly. After a difficult first half in which Stute struggled to get going, they improved considerably after the break. In the end could have won the game comfortably after Gareth Brown’s opening goal; but an own goal from Stephen O’Donnell denied them all three points. Brown looked lively for Stute in the early stages of Saturday’s game, but it was Ballyclare who looked more convincing in the first 20 minutes, and it took a timely interception from defender Darryl McDermott to keep the ball out of the net. Comrades’ Gary Brown thought he had scored when Stute goalkeeper Marty Gallagher parried a cross from the outstanding Michael O’Hanlon, but just as he headed goalwards, McDermott arrived from nowhere to make a crucial block to keep the ball out. On 43 minutes a Robbie Hume’s free kick brilliantly pushed away by Gregg Shannon, who somehow got the ball away behind for a corner. 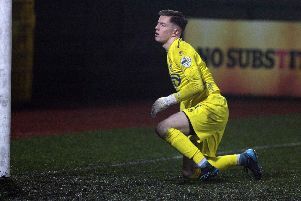 The Stute defender could not believe his luck, and even made a pointm of congratulating the goalkeeper for his efforts. Whatever Kevin Deery said to his players at half time had an immediate effect as they opened the scoring on 52 minutes, a free kick into the area was flicked on to the back post where Brown stood alone to volley it brilliantly across Shannon and into the net. Ballyclare were offering very little, even at 1-0 down, but they were given a gift of an equaliser when, in attempting to clear the ball back up field, O’Donnell sliced the ball into the air, where it sailed back over goalkeeper Marty Gallagher and into the net. The goal was a huge blow to Stute and it looked for a period that, Ballyclare would go onto win the game. But the hosts showed great character to regain control of the game, and in the final ten minutes, there was only one team interested in winning it. Kevin Deery threw on Jordan Armstrong in the closing stages and the midfielder very nearly set up the winning goal, crossing for Garbhan Friel, who should have scored from six yards, but he failed to get enough power on his header and instead glanced the ball wide of the post. In the very last minute of the game, Stute came agonisingly close again, when Armstrong crossed for McGinty, but his near post effort was superbly blocked by Shannon, who somehow pushed the ball around the post from close range. Institute: Gallagher, Crown, O’Donnell, McDermott, Morrow; McCauley (Armstrong 78), A Harkin (C Harkin 71), McGinty; Brown, Friel, Hume. Ballyclare Comrades: Shannon, Doherty, Woods, McIlveen, Getty, McCart, Brown (Trussel 62), King (McClurg 66), Reid, Simpson (Hill 85), O’Hanlon.